Reminder: Each Location Card is activated when you place the appropriate Character Card underneath it. Your Characters only gain points for you, in your own realm. However, the Characters of the other players may gain them points on your turn, if you activate a Character with the black "all players" icon on it. Also, only unwounded Characters are counted when activating any newly placed Characters. Those in the Infirmary, as well as the "bottom" side of split Character Cards, are not counted. Exception: Healing a Character and returning them to a Location does not activate that Location. The first Miller you place gains you 2 points. If you place a second Miller you gain 4 points, and so on. The first Brewer you place gains you 2 points and 1 Meeple. 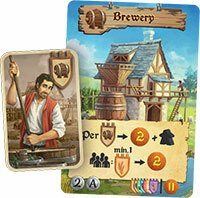 The second Brewer placed gains you 4 points and 2 Meeples, and so on. After that, you must clearly announce that ALL players (including yourself) who have placed at least 1 Miller gain 2 points. You place your third Brewer. You immediately gain 6 points and 3 Meeples. 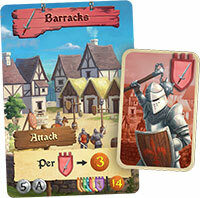 You must place 2 of those Meeples next to your worker card as there is only room to place one of them. You now announce to all players that if any of them has placed at least 1 Miller, he gains 2 points. Since you also have a Miller, you gain another 2 points. Since it is now the end of your turn, you must return the 2 Meeples not on your worker card to the supply, and gain 2 points for this. The next player then takes his turn. When placing a Witch in the Cottage, first check to see if you have any wounded Characters in the Infirmary. If you do, the top one in the stack is cured. (ONLY the top Character is cured, regardless of how many Witches you already have). 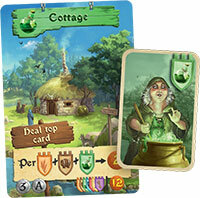 Then gain points for the placed Witch, for each Character depicted on the card. You do not need a set of these Characters! You place your second Witch, and heal the top Character in the Infirmary. This is a Miller, who is returned to the Mill (without activating the Mill). You now gain points. Since you have a total of 5 Characters depicted on the card in your realm, you gain 10 points. The Guard works much in the same way as does the Witch. 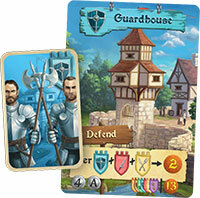 You gain 2 points for each Guard, Soldier and Innkeeper in your realm wjen placing a Guard in your Guardhouse. In addition, the Guard can also defend you. When placing a Knight, first check if the Knight's attack on each other player is successful or not. You then gain 3 points for each Knight in your realm. 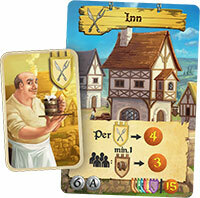 Placing an Innkeeper in your Inn gains you 4 points for each Innkeeper in your realm. You must then announce that ALL players (including yourself) who have placed at least 1 Brewer gain 3 points. 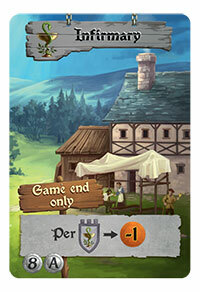 You place your third Innkeeper, gaining you 12 points. Then, every player with at least 1 Brewer gains 3 points. When placing a Noble in the Castle, you gain 5 points and 1 Meeple. 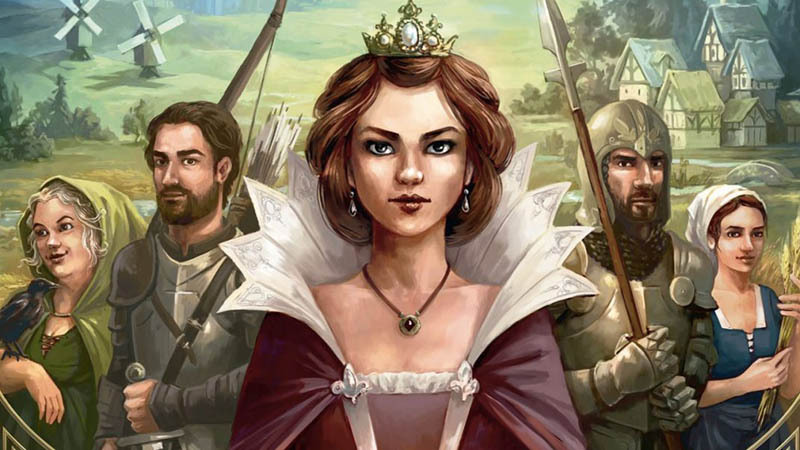 For your second Noble, you gain 10 points and 2 Meeples, etc. All Character Cards placed in the Infirmary are placed face down in a single stack. Unfortunately, at the end of the game you lose 1 point for each Character still in the Infirmary. You may look at your wounded Character stack at any time, but you may never change the order of the cards in the stack. We recommend using the B-sides of the Location Cards only after having played at least 5 times with the A-sides. The basic game rules remain the same, but the activation conditions are different. We will only highlight the B-side Locations that have a completely new special function, or are more unusual than their respective A-sides. Pay close attention to the new Majority values for each Location. The Variety scoring remains the same as it is for the A-side. 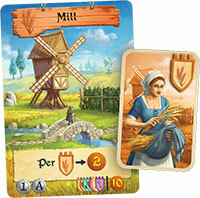 First, you gain 1 Meeple for each Miller and Brewer. Then you check to see if you have at least one set of both an Innkeeper and Noble. If you do, you gain 10 points. Even if you have more than 1 set, you still only gain 10 points. Then, as at the end of each turn, return any additional Meeples that cannot be stored on your worker card to the supply, and gain 1 point for each one returned. With this card, it is possible to gain no points at all when activating it. First, you check to see which type of Character you have the most of in your realm. You gain 2 points for each of these Characters. Remember that you gain that amount for each Innkeeper in your realm. First, you may trade 1 Meeple for 1 point, or vice versa. You may do this up to 5 times (since your worker card will either be completely empty or full after that). After that, you gain 4 points for each Noble in your realm and wounded Character in your Infirmary. 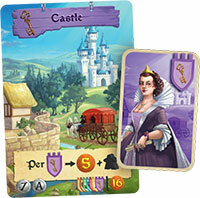 After placing an Innkeeper, you decide not to trade any Meeples/points. For your 2 Nobles and 1 wounded Character in your Infirmary, you gain 12 points. As with the A-side, the Infirmary is only scored at the end of the game. In contrast to the A-side, however, you now lose 2 points for each wounded Character still in the Infirmary. In addition, the player with the most wounded Characters in their Infirmary at the end of the game will lose another 10 points. If there are multiple players tied for the most wounded Characters, they all lose 10 points.